Nebraska Was So Great It Gets Its Own Post – Neales…on wheels! The weather has been eventful since the snowstorm in Colorado, with thunderstorms that wake us up at night, and strong winds that also wake us up from both the howling noise and the unsettling shaking of the RV. One particularly memorable and sleepless night had both a thunderstorm and high winds. Fortunately the kids are deep sleepers and haven’t noticed any of this; when I refer to “us”, it’s me and Chris, and Sky. Poor Sky hates the thunder, so when I haven’t been able to get back to sleep I usually sit up with her and read (to myself, not out loud to the dog) until the storm passes. With all this indoors weather I have a chance to share photos and stories from our time in Nebraska and South Dakota. Right now I’m in the campground laundry room (rolling baskets and folding table, check! ), wondering if the growing puddles outside will be added to Minnesota’s already impressive count of lakes. To be honest, I was expecting Nebraska to be a drive-through state, but loved what we got to see and experience with two stays in the western part of the state. Beautiful, surprising landscapes, and some fascinating history, from Miocene Era fossils to the Oregon Trail. Being able to take our time to discover places off the beaten track is something we really appreciate about full-time travel. Having said that, we based our route on two National Monuments and a State Park, so it’s not exactly unknown. But it should be better known! The pretty landscape we were expecting. The dramatic bluffs we were not expecting to find in Nebraska. Our first stop was the town of Scottsbluff, near the National Monument of the same name. Scotts Bluff is part of a series of rock formations that rise dramatically from the surrounding flat plains. The bluffs were a major landmark for Native Americans, and later for pioneers traveling West on the Oregon, California, and Mormon Trails in the mid-19th century. The Scotts Bluff Visitor Center has a fascinating mix of displays, from fossils like the skull of a Titanothere, to the largest collection of paintings by the artist William Henry Jackson, whose influential images of the American West include pioneers traveling through Mitchell Pass at Scotts Bluff. Fun fact: Jackson was the first person to photograph Yellowstone. How cool is this skull? Mitchell Pass, which still contains wagon ruts from the pioneers. We only stayed a couple nights, but our RV park was one of the most spacious we’ve been to. There was a huge expanse of lawn in the middle of the grounds, and Chris and I were trying to figure out what it was for. It wasn’t for anything! No picnic tables, volleyball nets… it was just a giant lawn. OK, yes, we were on the prairie and the edge of National Grasslands, but after living in Los Angeles and spending time in RV parks where the space is used, um, more efficiently, it was still a surprise. There were also giant lilac bushes everywhere, and iris flowers blooming around our campsite. And no dog ticks yet. The next drive was one of the most remote we’ve had so far: almost 50 miles north on State Highway 29 surrounded by prairies and the occasional ranch, without passing another vehicle. The landscape was monotonous, but also beautiful and peaceful, with waving grasses in varying shades of yellow, gray, and green, and an endless sky stretching to the horizon. The kind of landscape that calls out for through-the-windshield Open Road photos, of which I took many. We stopped at Agate Fossil Beds National Monument because it was along the way, but it is well worth a detour. The Visitor Center does a great job of displaying and explaining the significant treasure trove of Miocene era mammals that were excavated in the late 19th century from bonebeds in the Carnegie and University Hills nearby. My favorite piece was the Devil’s corkscrew, or daemonelix: a twisting burrow made by a kind of beaver called a Paleocastor. When you imagine uncovering this mysterious, perfectly formed corkscrew over 6-feet tall embedded in the rock, the name makes a lot of sense. Carnegie and University Hills through the Visitor Center windows. An unbelievable daemonelix fossil (photo from Trailside Natural History Museum). In addition to the fossils, Agate is home to the incomparable Cook Collection of Native American artifacts that should not be missed. Captain James Cook discovered the first fossils on his Agate Spring Ranch, and invited paleontologists to study and excavate. The Native American collection is a result of Cook’s longstanding friendship with the Oglala Lakota Chief Red Cloud, who traveled with his people from the Pine Ridge Reservation in South Dakota to stay at Cook’s ranch. Many of the pieces in the collection were made specifically for Cook and his family, or were of special importance: Red Cloud’s pipestones, American Horse’s war club, and Crazy Horse’s whetstone, which he was carrying when he was killed. 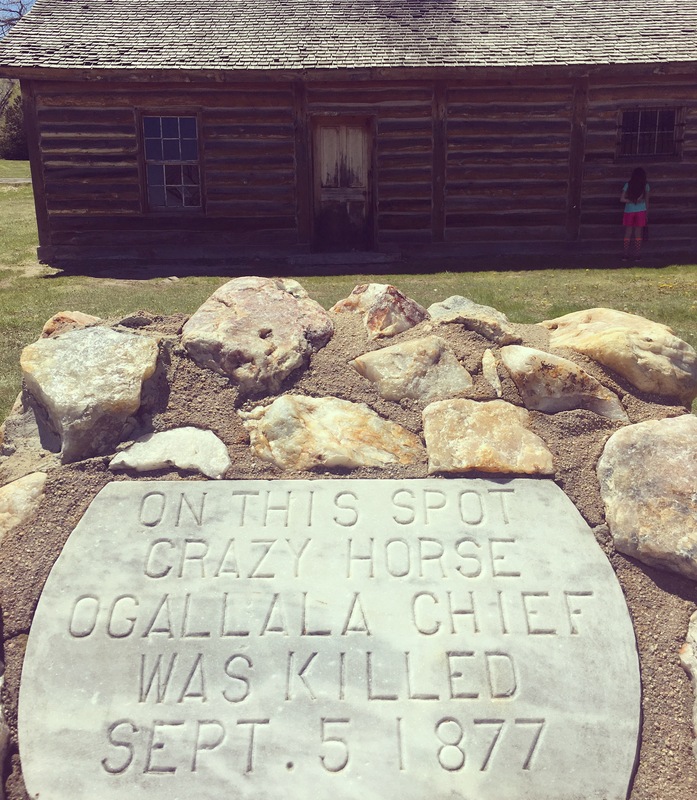 Crazy Horse’s sister gave the stone to Cook to preserve in memory of the great chief. It’s a really remarkable, beautiful, and poignant collection. We skipped the trails at Agate; partly because we wanted to get back on the road, but mainly because it was cold and windy and we wimped out. It would be pretty amazing to see fossils and devil’s corkscrews out in the original excavation sites. If you do visit save time for a hike, and please send me a picture. Rooms in some of the officers’ buildings can be booked for overnight stays. Our next stop was Fort Robinson, a Nebraska State Park and former US Army fort that is steeped in history. From playing a significant and bloody role in the Sioux Wars to a World War II POW camp, Fort Robinson was also host to the 1885 all-Black 9th Cavalry Regiment, better known as Buffalo Soldiers (cue Bob Marley). The Fort campus is beautiful, with big green lawns, neat cabins, twisted and towering trees, and stately red brick buildings. Our campsite was close to replicas of the log barracks where Crazy Horse was imprisoned and killed, and where a band of Cheyenne, including women and children, were held captive. 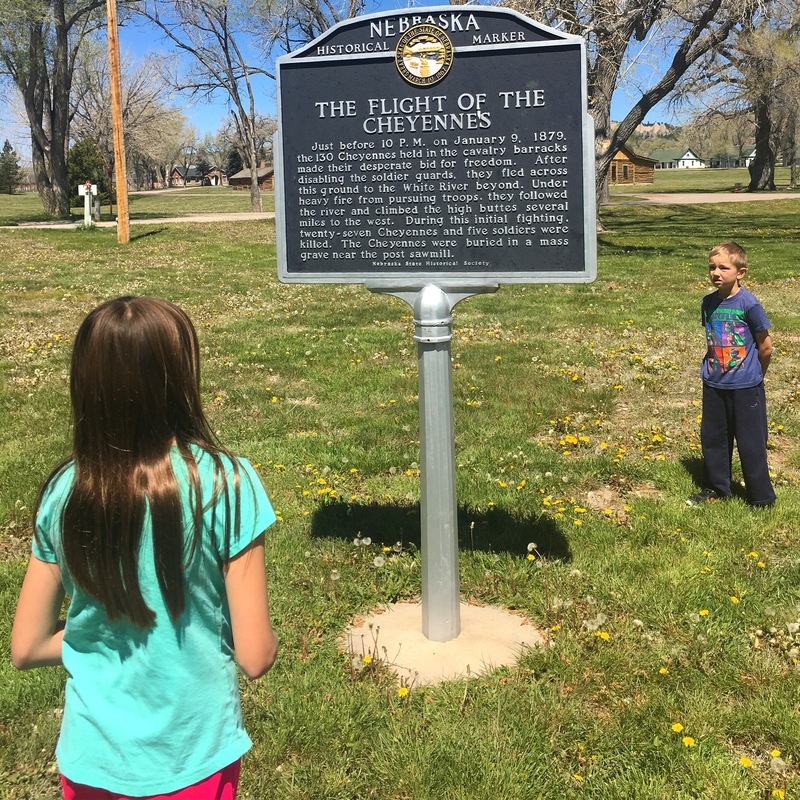 The Cheyenne were hunted down after escaping, in a tragedy called either “The Cheyenne Outbreak” or “The Fort Robinson Massacre”, depending on what you are reading. It was a fascinating and humbling place to stay, enjoying the beauty and peace of the surroundings while contemplating the history of all that happened there. Fort Robinson is also site of the University of Nebraska’s Trailside Museum of Natural History, featuring a famous fossil of two Columbian mammoths found with their tusks locked together in battle, and a reconstructed mammoth that reaches to the ceiling. A small but excellent museum, I got to explore the exhibits at my leisure while the kids enjoyed a crafts table on the balcony, complete with dinosaur-shaped playdough molds. The two mammoth fossils found locked together. More interested in playdough dinosaurs than real ones. There was also a fun dress up photo area near the crafts. Well this was supposed to be about South Dakota too, but clearly our time in each state need their own blog posts. Next up: The Black Hills, one National Park and three Monuments, buffalo, prairie dogs, and the national treasure of Wall Drug. But first – the sun is shining in Minneapolis, time to get outside! Scotts Bluff National Monument. Until next time, Nebraska! I’m wondering if you make your reservations ahead of time as you travel or just depend on your luck. We want to travel like this sometime, but I’ve been worried about the availability of spaces for a big rig. Obviously you are making it work. I LOVE READING these! Thank you, Kathy 🙂 We’re only making reservations one at a time, a day or so in advance depending on how long we are staying… we’ve never had a problem, but then we’re also not too picky. We use google maps to search a general area, and check online reviews. With next weekend being Memorial Day it took a lot more calls than usual, but we booked a place today. Last summer we had trouble around Labor Day too, but were flexible and eventually found something that worked. We didn’t get to spend more than one night each in Lake Tahoe or the Columbia River Gorge, but then we had 4 nights near Mount St Helens that ended up being one of the most memorable places. Thanks, I’m so glad you liked it! How cool 🙂 I loved having that view from our RV park, such a beautiful area! Thanks for stopping in my state! There’s actually a lot more here than people give it credit for. We even have the (now second) largest man made forest in the world! It really was impressive! I’d love to explore more, we may get to on our way back West. Thanks for the comment, I appreciate it! Pingback: State Capitols, Devils Towers, and Drive-thru Bars – Neales…on wheels!